Never underestimate the beauty of simple culinary techniques to bring about significant improvement to your daily life during and after cancer treatment. In this article, I want to share a question that I recently received in hopes that it will help others that are in a more difficult situation when it comes to being able to eat food during cancer and chemotherapy treatment. I am cooking for my husband with head and neck cancer. He has had radiation, chemotherapy, and all of his teeth removed. I really need some ideas on how to help him eat. The swallowing issues and him not having any teeth have been very hard to cook for, plus the altered taste and no saliva really limits food. This may seem like an overwhelming task but the great news is we can fix this! The primary problems as you highlighted are lack of teeth, change in taste, and lack of saliva. What I would recommend are the following: soup recipes, smoothie recipes, and a special category that I don’t really touch on in my cookbook but will teach you here very quickly. It is called a Puree. A puree is exactly what it sounds like. It is a fully cooked recipe introduced to a blender and liquefied. The good news is a puree tastes exactly like whatever food you made it out of. So let’s use baked potato soup for an example. You would make the baked potato soup as normal (which would normally be filled with big chunks of potato, bacon, and a hearty cream sauce). At this point, what you would do is either use an immersion blender and puree the food inside of the pot (like a marinara) or you remove some of the soup from the pot, add it to an external blender and blend from there. Another great thing about purees (beyond the fact that they taste like whatever you made them out of) is you can alter the consistency. (See my hummus and baba ganoush recipes in my cookbook.) If your husband is getting a bit of dry mouth, we can always add excess liquid to the puree to make it more runny. The trick to this though is not to loose flavor while you are watering it down. You still want it to taste good! My advice on that would be to use the following ingredients to stretch out and moisten the recipe: chicken broth, cream or whole milk, and other flavorful fluids that are similar to what you are preparing. Always exchange like for like. IE: milk for cream, chicken broth for water, tomato sauce for tomato juice etc. 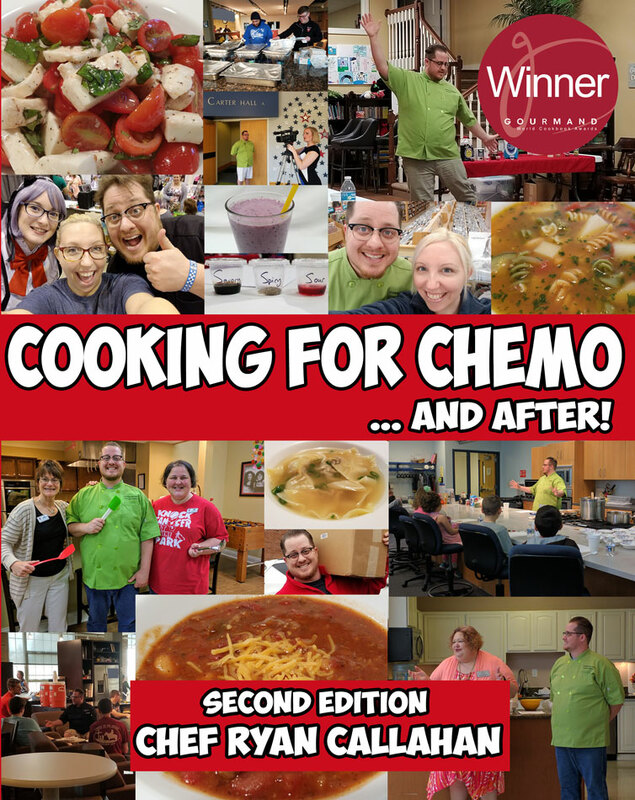 Reading my cookbook (Cooking for Chemo …and After!) 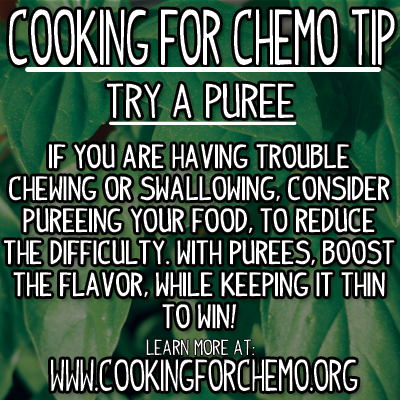 will help this make a lot more sense because you will learn how to properly season the food before you puree so it will still taste delicious and help you to also combat the other cancer treatment side-effects. The third great thing about purees is that they can be served hot or cold. Gazpacho is a perfect example of a cold puree. This recipe is also in my cookbook. Purees were actually a very fancy way of preparing soups and side dishes in the early 1900’s. The act of pulverizing a food product was thought to make digestion easier since it did not require any chewing, but still maintained all of its nutritional value and fiber. There are tons of classical recipes for purees. You just might have to do some digging to find some recipes that you like. The big key difference between a puree and baby food is adult flavor. Follow the Roundness of Flavor and Palate Cleansing techniques in my cookbook and you should have absolutely no trouble with this. One last thing to remember, make sure you have plenty of fluids going into your husband because you want to absolutely avoid dehydration at all cost. Believe it or not, water is actually not a very good re-hydrator and will tend to taste terrible while on chemotherapy. Look to lemon lime sports drinks, fruit juices that he enjoys (especially the more citrusy ones), broths, and last but not least do not discredit meal replacement smoothies as an excellent way of sneaking a few extra vitamins in as needed. Hope this helps. Feel free to write me with any more cooking questions.